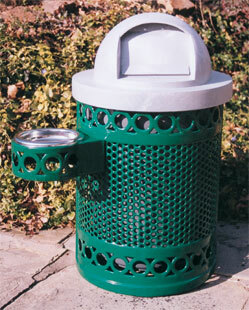 Beautify your walkways and eating areas with these attractive and highly durable receptacles. Made from 11 ga. perforated steel, covered with a highly weather-resistant thermoplastic coating, and finished with a lightly textured matte Polyethylene color coat. These beautiful receptacles with their circular steel pattern design will provide years of service. Available in the colors shown below.